There doesn’t seem to be much in the way of posted airchecks from the late 1990s anywhere, and possibly because by then, radio had gelled into the early stages of what we have today, with perhaps more live voices than now. Either way, WLAN-FM sounds very similar in sound to another station we know well, 104.5 WXLO Fitchburg/Worcester (Massachusetts). But what’s the difference? 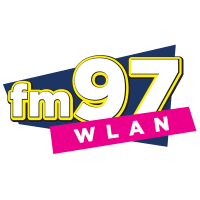 WXLO has always been solidly in the Adult Contemporary format and this WLAN-FM is CHR. Calling themselves just “FM 97 WLAN-FM”, they do play pretty much everything Rock, pop and almost Hip Hop (before it became mainstream). In fact, there’s so much Alternative product concentrated in the music from 1998, this is almost an Adult Rocker with a few pop tunes thrown in. Plus, an 80s stiff from The Cure. The jock only goes by his first name, Jordan. Encoded from the original master tape. Before ending up in the hands of CC, FM97 was locally owned. It has been CHR since the early 80s. Before that, WLAN-AM 1390 was top 40. In 1998, you either sounded like this or were extreme CHR like WXYV Baltimore was.